Unlike any other before it, the WMF 8000 S – WMF‘s new premium model – combines quality, perfection and innovation with unbelievably good coffee. Its design has already won the coveted iF Design Award. With its revolutionary “Man Machine Interface“, it guarantees that all functions are simple to understand and to use in an instant. When it comes to performance, the WMF 8000 S is yet again a trend-setter. From pressing your selection on the display to the perfect coffee – the timing of numerous processes has been hugely improved. When it comes to equipment for milk and steamed drinks, the WMF 8000 stands head and shoulders above the competition in terms of the range on offer. The Active Milk version even allows the fully automated preparation of hot and cold milk and foamed milk drinks. The optional light rings not only look chic, but they also make your day-to-day work easier. For example, if a bean hopper has to be filled, the rings flash in a signal or changing ­colour to warn you about this. The timer function means that you can choose suitable times at which you want to switch the WMF 8000 S on and off, and activate or deactivate individual functions and drinks. For example, you can switch from service to self-service, from drinks with fresh milk to drinks with topping powder, etc. On request, the WMF 8000 S can also be ordered with a new fully ­automatic cup tray. This “cup lift” automatically raises coffee and Espresso cups or Latte Macchiato glasses to the ideal height for pouring. A practical and convenient feature – especially in self-service mode! 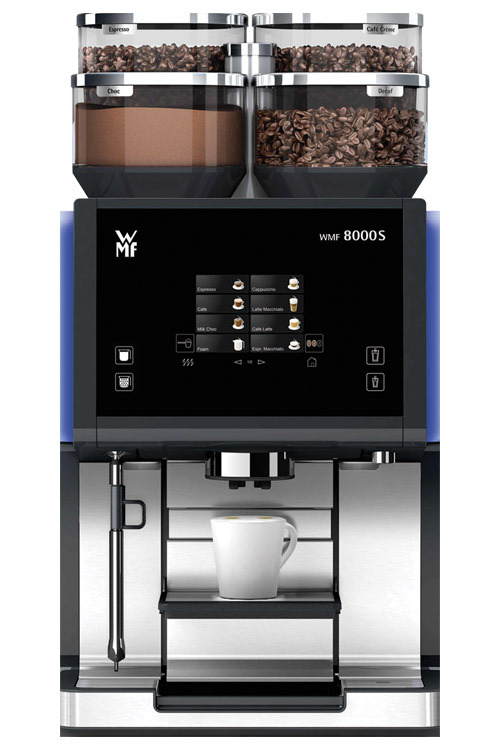 Of course, the WMF 8000 S is also available with a manual cup lift. Either way: With the WMF 8000 S, the cup goes to the dispenser and not the other way around. Before the first machine reaches the customer, many test machines have already undergone millions of tests. Each machine is built at the Geislingen site and, before they leave the plant, they are thoroughly tested. Simple Made-in-Germany ­quality from WMF! The perfect coffee taste is based on levels of quality that have been clearly defined as a result of a long series of tests for each individual drink. In addition to this, the quantity of ground coffee, the volume of water and the water temperature can be set for each drink. You can even choose to mix together all of the coffee varieties from the three bean hoppers. In the Active Milk version, the machine automatically prepares milk drinks and foamy milk drinks, whether hot or cold. In addition to the brewing time and water quality, a perfectly adjusted temperature is crucial for the release of the full tea aroma. Three presetable hot water temperatures mean that you can get the fullest taste from any type of tea. All four product hoppers can be removed using the central locking system. The coffee bean hoppers are even suitable for cleaning in the dishwasher, which is practical and makes cleaning the machine a lot easier. With heights of up to 195 mm under the coffee dispenser and 220 mm under the hot water dispenser, large containers can also be filled. This means that you can make a whole pot of coffee for breakfast or in an office. For example: Do you work in the “coffee-to-go” sector and use different sized coffee mugs? The practical Small-Medium-Large (SML) function will help you to easily assign predefined mug or cup sizes to each required drink. In just a few small steps, the WMF 8000 S becomes a self-­service specialist: Switch from a double cup dispenser to single cup dispenser, extend the hot water dispenser and make your selection on the “single line” display – done! For those who like convenience, there is also the fully automatic “cup lift”. It's quite simple: The MMI touch display on the WMF 8000 S.
With its revolutionary “Man Machine Interface”, the WMF 8000 S guarantees that all functions are simple to understand and use in an instant. This means that no effort is required for you to set the perfect coffee quality or change the lighting, or for your guests to use the machine in self-service mode. Using Remote Data Access, you can call up important information from anywhere and at any time, as you require. If you have several machines, this provides you with more transparency and helps to have an overview of everything. You decide how to prepare the milk foam or hot milk for your guests: Quickly and at the touch of a button; or the classic method using Auto Steam (fully automatic steam valve) or Easy Steam (semi-automatic steam valve). The WMF 8000 S offers you ­everything you need. The temperature of the milk is crucial for the quality of the milk foam. The WMF 8000 S helps you to ensure that the temperature of the milk is kept constant and to thus ensure that the quality of the milk foam remains consistently high. An optional sensor in the cooler monitors the temperature of the milk and shows this as a graphic in the display. If the sensor issues the message “Milk too warm”, the electronic pinch valve automatically adjusts the milk feed. As an ­option, certain types of drinks can even be blocked until the milk is cool enough again. This guarantees that your drink is always of the highest quality – especially cold milk drinks and cold foamy drinks. To automatically clean the machine, use the display to activate the practical manual insert option. Simply insert a tablet and the cleaning cycle begins. The patented Plug+Clean milk cleaning system effortlessly cleans all of the parts which are in contact with milk, while still fully complying with the HACCP. A ground hopper can never be big enough. This is why we have given the ground hoppers on the WMF 8000 S truly generous ­dimensions. But for anybody who feels that this spacious hopper is still not big enough, they can also choose the optional ground disposals through the counter top.